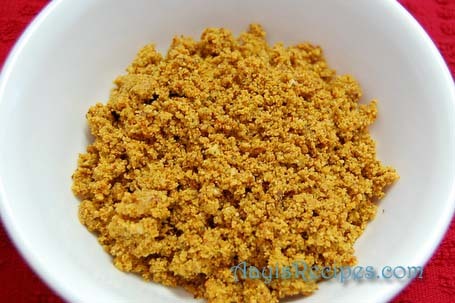 I think every Indian cuisine has a set of ‘chutney pitto/chutney podi/chutney powder’ recipes. We too make different types of ‘chutney pitto‘ (pitto-powder). Usually most famous chutney powders are the ones with coconut in it. We serve it with bhakris, dosas or idlis. Everybody will have their stock of chutney pitto all the time. I simply love this Shenga(peanut) chutney pitto. Roast (without oil) coconut, tamarind and curry leaves till the coconut turns slightly brownish. Let it cool to room temperature. 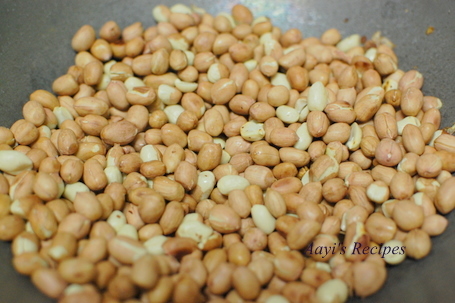 Roast (without oil) peanuts and remove skin, ready made roasted peanuts can also be used. Let it cool to room temperature. 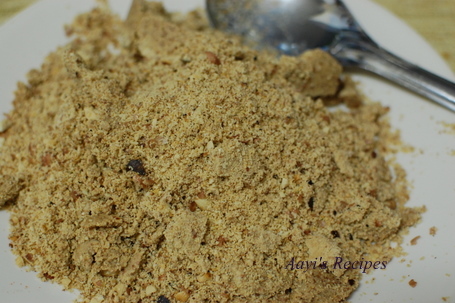 Grind coconut mixture to a coarse powder. Then grind peanuts, there should be some small pieces of peanuts visible. 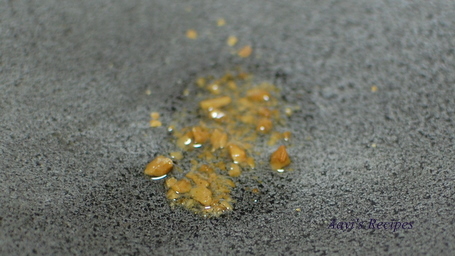 Oil comes out of roasted peanuts if it is ground for a longer time. So stop the grinding when it is coarsely ground. 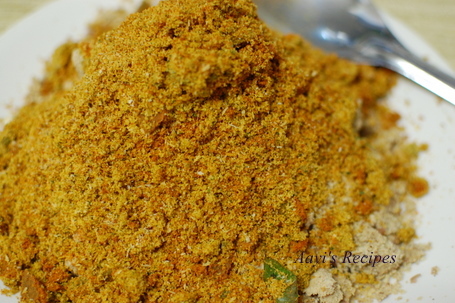 Mix coconut powder, peanut powder, chili powder and salt. Store in an airtight container. 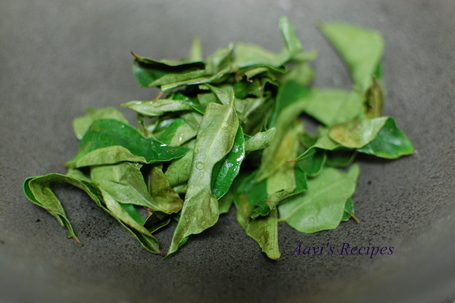 Hi Shilpa….My mom makes the best shenga chutney and lasune chutney. She makes it one more way, uses only roasted peanuts, chilli pd, hing and salt. Tastes great when mixed with curd and served with phulka. 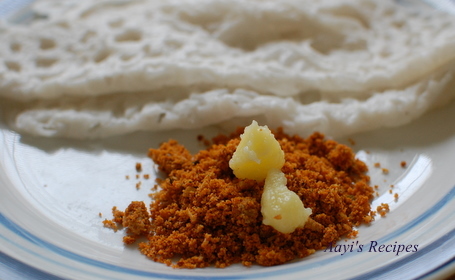 I love this karrappodi always good for all tiffins and mom makes the same way you did and semiya idlis looks yummy.I do make instantly if i dont have batter in fridge. Why cant you send for weekend breakfast event. I have book marked this for trying, i love chutney podis of all sorts. Thank you for the recipe Shilpa. thanks, I got what I was looking for. 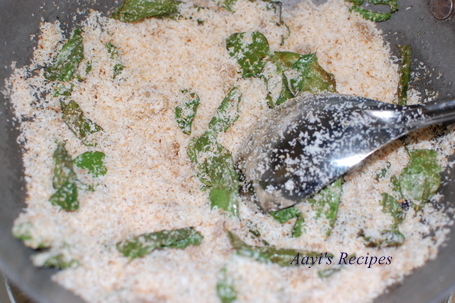 I have seen dry pan fried garlic pieces being added to the mixture.sure gives alwhole new taste to the chutney. Can you please give a recipe for spinach/palak puris. I just got onto your site by chance and have really enjoyed it..
You seem to be a doing an amazing job!! I made this over the weekend & liked it a lot.The aroma that was filled in the kitchen took me back to Kumta :-)Thanks for the recipe. Shilpa: Haha..you are like my dad..he loves this in anything and everything. He even likes to put some chutney powder on hot rice, then add a dollop of ghee and enjoy. He also likes to eat them with mosaru vadas. Hubby loves to eat these with chapathis. I love to apply this along with some ghee to bread and toast it :D.
All ur recipes r yummy!! And when exactly do we add the hing?
. using tamarind paste instead of pieces(I have a big box of tamarind concentrate at home). Since this looks like a dry powder I am not sure paste would work? 2. Can I leave out hing? Or is it v important for this recipe? 3. 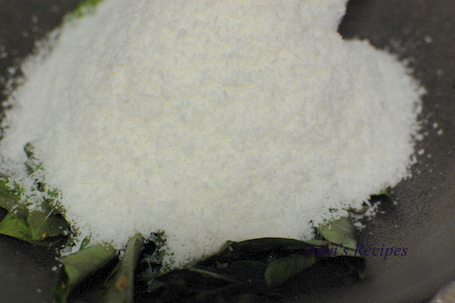 Can I use dry dessicated coconut(that we find in desi stores) for kobbari? Not sure if it’s the same. Thanks for the reply. Do I need to fry it along with cocnut if I am using paste? And is this a very tangy powder? Will 1/2 tsp tamarind paste work fine with this recipe? Tried it today. I am sure I will be making it often , it’s so yummmm. Thanks !